The playoffs are finally here! We’re so ready. Are you as ready as we are? 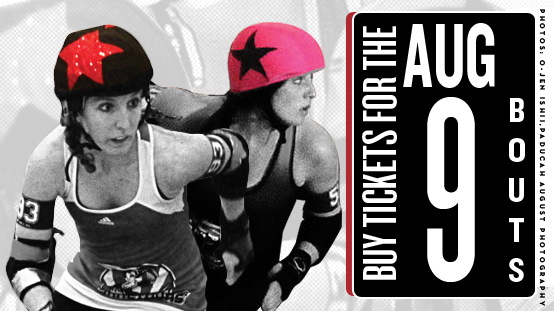 Grab those tickets, your friends, and a cooler and join us for the action! 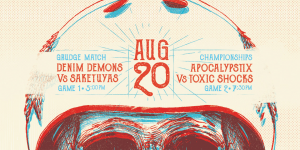 The Denim Demons meet the Sake Tuyas in the first playoff game of our 2014 season! The last time these two teams met, the Demons came away with a commanding lead, but the Sakes have ninja powers up their sleeves. Who will go on to the Championship game on August 30? In the second game, The Toxic Shocks take on the Apocalypstix. The Shocks are undefeated this season, but the Apocalypstix have new blood and a new attitude- they’re in it to win it! The Denim Demons are taking on the Sake Tuyas, and it’s going to be a fight for the books (the history books, not the gambling books!) The winner of this game will advance to the championship game on August 30, and both teams are hungry. 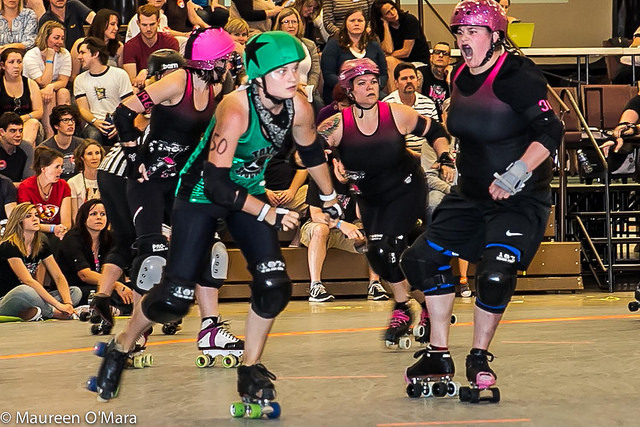 The Demons have some of the best blockers in the league- you may have heard of Queen Loseyateefa and Switchblade Siouxsie, but also keep an eye on Lez Dispenser. 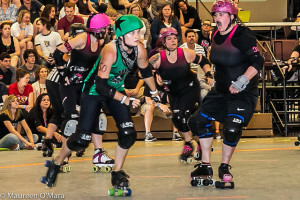 She breaks jammer hearts everywhere she goes! The Sakes are ready for anything under the guidance of their captain Amelia Scareheart, who’s leading them into battle with knowing good team work always wins. With the addition of transfer Shannanigan’s knockout blocking, and jamming by Wheelin’ Jennings, the Sakes are ready to fight! The Toxic Shocks take on the Apocalypstix in our second bout, and this one is going to be intense. 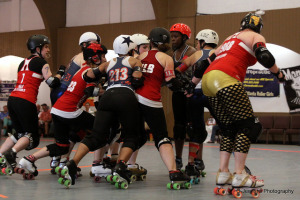 The Demons were the heavy favorite in last month’s game against the Stix, but the Stix gave them a scare during an exciting game of back and forth leads. The Shocks are undefeated this season, no doubt the result of teamwork and good old-fashioned hard work. You can’t miss Belle of the Brawl– whether she’s jamming or blocking, she’s hitting somebody really hard. And additional blocking by Nattie Long Legs and jamming by Jammunition makes the Shocks a true force. The Apocalypstix are ready for a trip to the Championship game- they haven’t seen one since 2011. They’ve worked hard this season, as evidenced by last month’s almost-upset. Keep your eye on Slamborghini– she blocks like a truck you don’t wanna get hit by. And the addition of transfer Slams Mckenzie seems to be a catalyst, causing a chemical reaction of awesomeness. 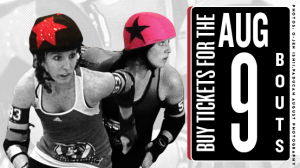 Don’t have your tickets yet? There’s still a little time left! 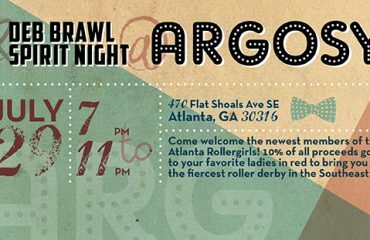 You can buy tickets either online or by visiting Powerhouse Skates at 331 Elizabeth Street NE, Suite E, Atlanta, GA 30307. Don’t wait until this one sells out. You definitely won’t want to miss it! 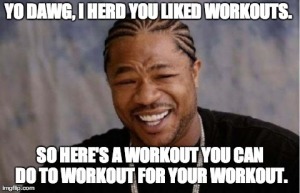 A Workout for Your Workout.